This interactive hub will look at future technologies in the operating theatre. The stations will range from how theatres are designed using MicroSoft’s HoloLens technology, new capabilities and troubleshooting of endoscopic camera systems and virtual reality laparoscopic trainers. This hub will showcase the latest technology to improve your surgical skills and theatre efficiency. We invite you to register for this opportunity to learn from an expert minimally invasive, robotic surgeon. The goal of the Medtronic Interactive Hub is to improve patient outcomes, by assisting Gynaecologists to stay informed of advances in technology and clinical practice. • The differences between and benefits of monopolar, advanced vessel sealing and ultrasonic technologies. • Best practices for avoiding electrosurgical injury. • The mechanics of laparoscopic suturing with curved needles. • The mechanics of intracorporeal and extracorporeal knot tying. The sessions will also enable participants to identify the potential benefits, risks and challenges associated with the performance of Total Laparoscopic Hysterectomy procedures. Members are invited to register for the Medtronic Interactive Hub which will be facilitated by key ANZ proctor surgeons. The Hologic Hysteroscopic Training Hub will consist of two simulators, for both the NovaSure® Endometrial Ablation system and MyoSure® Hysteroscopic Tissue Removal device. There will also be two hysteroscopic tower stations, allowing participants the opportunity to utilise the new MyoSure Manual Device, which is being unveiled at the AGES conference. The MyoSure Manual is an all-inclusive, and integrated tissue removal device, not requiring an external power source, vacuum or tissue specimen trap. It has been designed to take the complexity out of routine hysteroscopic tissue removal. Delegates will receive access to an online App from Johnson & Johnson Medical with informative material on Laparoscopic skills and suturing. By attending the AGES Interactive hub, they will receive a one hour Non- didactic session facilitated by faculty, who will focus on the application of the pre-learning material. Post attendance the delegates will be able to attend another session at a state level where they can increase their skills in Laparoscopic surgery. Minimally invasive surgery (MIS) places special demands on the medical training and further education of surgeons. KARL STORZ, one of the leading manufacturers in the MIS sector, is committed to providing its customers with optimum support for medical training and further education. The KARL STORZ interactive hub will enable participants to work with a range of quality instruments on various models and animal specimens to improve their confidence and skills in the areas of Hysteroscopy, Bipolar Resection and to refine techniques on Morcellation. Lastly, participants will also have an opportunity to experience the latest virtual reality trainer. Mercy Hospital for Women is proud to host this year’s pre-conference workshop in hysteroscopic surgery. New things are happening in hysteroscopy! How on earth are we able to keep up with the things that affect our bread and butter surgery? This workshop has been crafted to fill the gaps in our education in order to help us to practice hysteroscopic surgery as modern, up to date gynaecologists. This is a very practical half-day workshop with hands-on experience in operative hysteroscopic surgery, including but not limited to: resection of polyps; fibroids; NOVASURE ablation; myosure procedures; and stations to help us understand the mechanics of fluid management. We will limit the numbers in order that each participant has a personal immersive learning experience. Steve Jobs said innovation distinguishes between a leader and a follower. The challenge with innovation in medicine is balancing the ability to offer your patients the best procedure available, which may be a new intervention but doing it in a way that is evidence-based and minimises risk. This discussion will explore these issues from an ethical, medico-legal and clinical perspective. Let’s keep the momentum going! 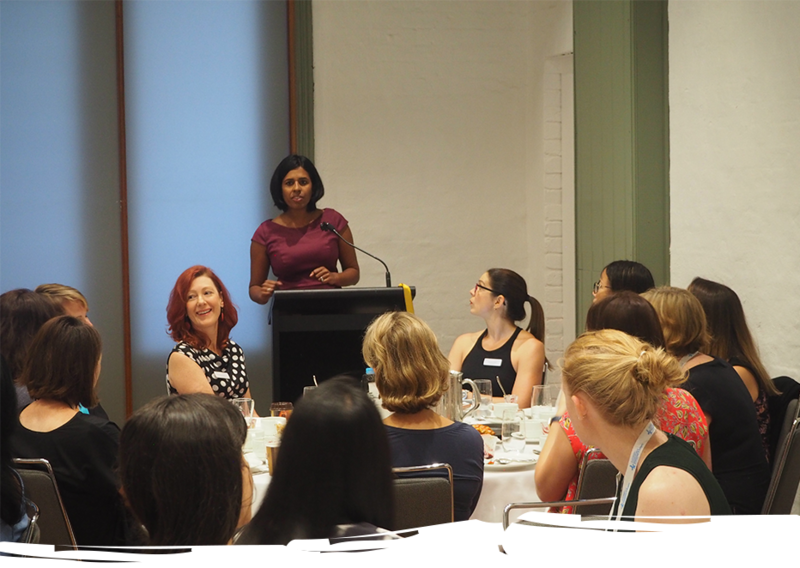 Following on from our sold out Women’s Breakfast at the 2017 ASM in Sydney, AGES is proud to present Jamila Rizvi, author, presenter and political commentator. Described as one of the preeminent voices of young Australian women online, Jamila injects her own special brand of humour, irreverence, and authenticity into the public debate. Jamila has just published a book, Not Just Lucky, about the barriers to women in the workforce and is here to give us her take on women in surgery, and other workforce issues. Jamila has been privy to the highest level of politics in the land, working for Kevin Rudd and Kate Ellis, is the former Editor in Chief for Mamamia Women’s Network websites, and appears regularly on The Project, The Drum, and ABC News Breakfast. Jamila is also host of ‘The Schmunday Show’ on Fox FM, Melbourne. In 2014 Jamila was named one of Cosmopolitan’s 30 Most Successful Women Under 30 and in 2015, was listed as one of Australia’s 100 Women of Influence by the Australian Financial Review. In 2017 she was included in the Weekly Review’s top ten list of young rising stars in Melbourne. Jamila has a unique voice on the issues related to women in the workforce. Come one and all to spend a refreshing breakfast in conversation with Jamila.